BERKELEY, CA  NASA has announced that it will support an advanced mission concept study for the SNAP experiment, proposed by the Department of Energy's Lawrence Berkeley National Laboratory and the Space Sciences Laboratory of the University of California at Berkeley for NASA and DOE's Joint Dark Energy Mission (JDEM). In addition to SNAP, NASA also selected the ADEPT and DESTINY proposals to perform mission concept studies for JDEM. 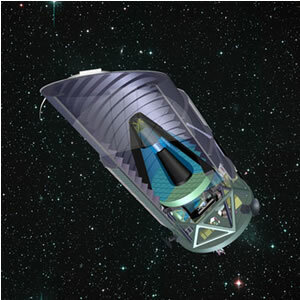 "As one of three groups chosen by NASA for further development of the Joint Dark Energy Mission, we are pleased that NASA is interested in our approach to the problem with the SNAP concept," said Berkeley Lab Director Steven Chu. "DOE and NASA have provided funding to us in the past for our approach, and it is a very good sign that the two agencies are moving forward together on the project." SNAP, the SuperNova/Acceleration Probe, is an experiment designed to learn the nature of dark energy by precisely measuring the expansion history of the universe. At present scientists cannot say whether dark energy has a constant value or has changed over time  or even whether dark energy is an illusion, with accelerating expansion being due to a gravitational anomaly instead. Using supernovae as standard candles has been a goal of astronomers since the 1930s; beginning in the 1980s, Perlmutter and his colleagues developed practical techniques for using Type Ia supernovae to measure changes in the expansion rate of the universe. "SNAP will find thousands of very far-off Type Ia supernovae and measure their magnitude and determine their spectra with unprecedented accuracy, detail, and control," he says. Michael Levi of Berkeley Lab's Physics Division, SNAP's co-principal investigator, says, "The weak gravitational lensing technique will allow SNAP to independently probe the growth structure of the universe. Weak lensing has been part of the SNAP concept since its beginning in 1999, and is potentially an even more powerful way of measuring dark energy's effect on the distribution of matter, by observing the apparent displacement of distant galaxies when the mass of a foreground object bends their light. Both the supernova technique and the weak lensing technique will benefit by using a space-based telescope, which eliminates problems inherent in observations from the ground." Remarkably, dark energy, now thought to account for some three-quarters of the density of the entire universe, was unknown before 1998, when the Supernova Cosmology Project and the High-Z Supernova Search Team independently announced their discovery that the expansion of the universe is accelerating. As leader of the Supernova Cosmology Project, Perlmutter has recently been recognized as codiscoverer of dark energy with two prestigious awards, the Feltrinelli International Prize in the Physical and Mathematical Sciences from Italy's Lincei Academy, and the Shaw Prize in Astronomy, which he shares with Brian Schmidt and Adam Riess of the High-Z Supernova Search Team. The Dark Energy Task Force commissioned by NASA, DOE, and the National Science Foundation has called dark energy "among the very most compelling of all outstanding problems in physical science." The task force has determined that different techniques for measuring dark energy in combination "have substantially more statistical power, much more ability to discriminate among dark energy models, and more robustness to systematic errors than any single technique." SNAP not only employs two independent techniques but allows both kinds of observations  changes in expansion rate and changes in structural formation  to be undertaken by a single powerful telescope. SNAP also includes a 600-million pixel imager that will make use of the robust, radiation-resistant, and uniquely red-sensitive astronomical CCD developed at Berkeley Lab, as well as independent spectroscopic instruments. Since it was originally proposed by the SNAP team in 1999, the Department of Energy's Office of Science has vigorously supported intensive research and development efforts for the design and instrumentation of the SuperNova/Acceleration Probe concept. NASA has supported development of the concept since 2003. SNAP is also supported by its international partners, including the French Space Agency, the Centre National D'Etudes Spatiales (CNES), and through the active interest of the Russian Academy of Sciences. In addition to the lead institutions, the UC Berkeley Space Sciences Laboratory and Lawrence Berkeley National Laboratory, NASA's Goddard Space Flight Center and Jet Propulsion Laboratory will collaborate in development of the advanced mission concept, joined by industrial partners Ball Aerospace & Technologies and the Lockheed Martin Space Systems Company. Academic institutions who are participating in this work on SNAP include the American Astronomical Society; the California Institute of Technology; France's Centre de Physique des Particules de Marseille (CPPM), Laboratoire d'Astrophysique de Marseille (LAM), and University of Paris VI (LPNHE), which are funded by the Institut National de Physique Nucleaire et de Physique des Particules (IN2P3) and Institut National des Science de l'Univers (INSU) of the Centre National de la Recherche Scientifique (CNRS), and by the Centre National D'Etudes Spatiales (CNES); the Fermi National Accelerator Laboratory; Indiana University; Moscow State University; the Rochester Institute of Technology; Sonoma State University; the Space Research Institute of the Russian Academy of Sciences; the Space Telescope Science Institute; the Stanford Linear Accelerator Center; Stockholm University; the University of British Columbia; the University of Chicago; the University of Maryland; the University of Michigan - Ann Arbor; the University of Pennsylvania; the University of Victoria; and Yale University. For more about SNAP, including high-resolution images, visit the SNAP website at http://snap.lbl.gov/.